This Merlot looks great and tastes just as good. Its what you would expect from a good rounded merlot, produced from the Los Espinos vineyards based in the Central Valley of Chile. 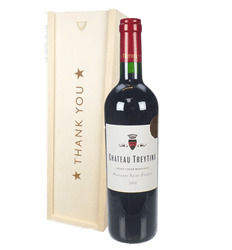 The wine comes presented in one of our 'Thank You' branded wooden gift boxes making it the perfect gift. Needing to say thank you for something - then our wine thank you gifts should do just fine. Presented in a wooden thank you gift box, choose from either red wine, white wine or rose. All are delivered on a date you choose and come beautifully presented complete with your own personal gift message.